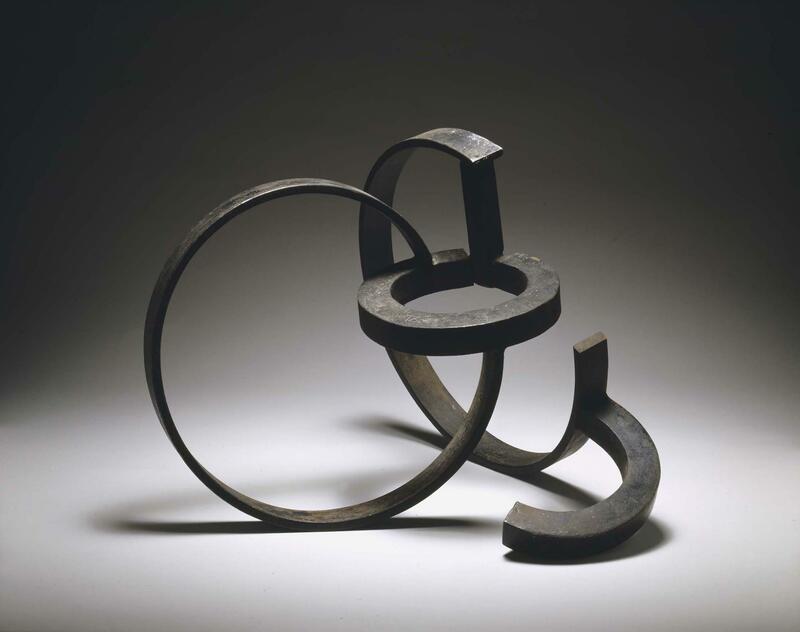 The sculpture De la serie de la desocupación de la esfera (From the Disoccupation of the Sphere Series) is a dynamic construction based around linear forms of twisted curves. It was works like this that won Jorge Oteiza the sculpture award at the 4th São Paulo Biennial in 1957, thus giving him considerable influence on the development of the Brazilian Neo-Concretist movement. The investigations into the area of the emptying or disoccupation of the sphere came about through the work the sculptor was doing on models, which he called the Laboratorio experimental (Experimental Laboratory). Here, Oteiza worked on the cylindrical form using pieces of metal to join two curved forms with differing spatial orientations, which naturally evoked the idea of movement and the real possibility of adopting different positions. Oteiza’s sculptural work posited, in his own words, “the Statue as a purely spatial organism.” The disoccupations of the sphere possess a calm unitary complexity, suggesting centrifugal movement that liberates the active space or nucleus; an idea that for Oteiza always held a metaphysical connotation.